Kiki Out of the Kitchen & Into the World: Why I'll never be a "Food Blogger"
Why I'll never be a "Food Blogger"
I will never be a food blogger because I don't have the patience to pose my food beautifully or remember to write down what is going into my dinner. Or even what I had for dinner some nights. But I do at least think about these things and OCCASIONALLY remember to take a photo. 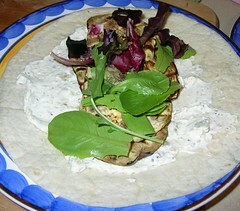 For my wrap-fest, the only one that got near a camera was eggplant night. You will notice immediately that eggplant, while tasty, is not very photogenic. Sadly the goat cheese spread on a flour tortilla doesn't do much for the color. Thank goodness for a little lettuce mix. It was probably slightly redundant to serve it with a salad, but hey, I needed to add something to call it dinner and I thought that chips would diminish that "healthy" aspect I was kind of going for. (It's only a little goat cheese, it just looks like a lot) Or maybe this is the shrimp one. Since I didn't slice for the photo, who knows! Also not to be missed is another amazing chef/photographer who answers the Eternal Question What's for Lunch Honey? There are tons more out there, but those are my current faves! Anyway, I did a variation on my grilled pizza and am very excited because I learned that it will be possible for me to make these year-round. 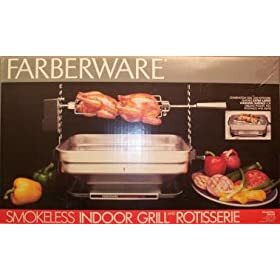 My ever trusty Farberware grill. My parents got one as a wedding gift, my mom picked up a spare for parts at a garage sale because she was frightened it would one day fail. I got mine when the local Service Merchandise was closing. It is rather large & a pain to store, but it is an awesome piece of kitchen equipment. (It's most common use in my home is the rotisserie feature for a Christmas duck. There is NO other way to cook it!) So I saw it sitting there and decided that was the answer to hot food. I made my pizza dough as normal, but when it came time to shape it, I used an empty tin to create small (about the size of an English Muffin) individual pizza crusts. I hammered them out and put them in the freezer until it was time to go. I wanted to keep it as simple as possible (or at least as simple as I could at this point) so I prepped for 2 kinds of pizza. The first had a cheese spread made with Goat Cheese (I can get an 11 oz. log for $5.25 at the local farmer's market; it is a staple in my house) mixed with cream cheese and fresh snipped herbs. I think I used oregano, marjoram, rosemary and thyme with a little salt and pepper. 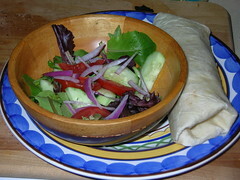 I also had caramelized onions (another favorite in my home) and roasted red-pepper. My other variety was fresh mozzarella marinated in Balsamic vinegar, sliced tomato in olive oil and fresh basil. I prepped all the toppings and put them in their plastic containers and trudged off to the Gallery. The creation of these mini-miracles was actually pretty easy. Amazingly enough, this worked out really well. The pizzas cooked up brilliantly and disappeared as fast as I could make them. I also figure that I can make a bunch of small crusts (maybe muffin sized, maybe dessert plate sized) and freeze them ahead of time so that the mess of the crusts is out of the way, and I can eat these on a whim instead of on several hours notice. (The dough is very simple, but it does take time to rise, and I usually make a big mess--which is another reason I don't take photos). As you may have realized, these are very unconventional pizzas, but I haven't figured out a better name for them. My husband was vying for "Grillza" but I am not so sure. Any ideas?? I am also constantly looking for ideas of what to top these with. I did get a great inspiration tonight. How perfect would an upside down version of these be? Pizza Rockefeller anyone? Any other suggestions for these? Please, I think I'm in a (tasty) goat cheese rut! To republish any portion of this blog, please contact Karen Lynn Haver, the author, at kalyme at gmail dot com. For a general FAQ on copyright pertaining to blogs, please visit the Electronic Frontier Foundation's website, here. If you have questions regarding the legality of digital copyright, click here to read a copy of the Digital Millenium Copyright Act.